How to think of light in terminologies like data-mapping, generative systems and control via algorithms and software programming? How to make light (inter)active or responsive and to let it partake in the data flow between different media on stage? How to let the audience experience rhythms and cycles of light and movement? This year I have been researching and experimenting on the subject of Interactive Light – for which I received a development budget from the Amsterdam Fund for the Arts. I have been interested in light for many years. As an architect, I worked in lighting design for architectural environments. As scenographer, I am interested in the spatial, sensory and rhythmic qualities of light, and how it responds to other media – how it relates to the image, or to movement. One of the reasons doing this research is the observation that conventional lighting boards favor regularity and sequential order (programming cue-to-cue, where you mainly design one image after the other), which have become dominant lighting strategies for theater spaces. But this approach does not suit the way I see theater spaces – as a kind of ecology and a space for interaction between all elements of a performance. In this context, I see light less as a means to put the performer center stage, rather, I am looking for ways to make light a tangible “actor” at play. Additionally, the advent of LED lighting fixtures and intelligent lighting might course consequences for independent lighting designers working in small to middle sized theaters. What is to gain from this new technology, how can we experiment with it, and what are the consequences in terms of time and financial investment? There is a need to gain access or custom-build equipment that is affordable, portable and allows for experimentation and a nuanced way of control. For this part of the research I collaborated with the lighting designer and scenographer Bruno Pocheron. Treating a grid of x by y single traditional fixtures (each fixture has 1 DMX address) as a matrix came as a solution to devise ‘haptic’ / ‘organic’ ways of using analog theater lamps with real time input. Different kinds of inputs (described below) have been experimented with. In all cases, we decided to output full DMX frames to a specific layer/mixer of a Lanbox LCX via UDP and/or artnet. That way allowing to mix ‘haptic’ input to a grid of lights with pre-programmed light cues. – input from graphical tablet (vvvv): generation of one sphere object when touching the stylus to the tablet. x/y coordinates define which zone of the light matrix is triggered, pressure affects intensity, size affects the range of the part of the light matrix affected, several parameters such as scaleX and scaleY, blur, invert, master intensity and time, allow for a smooth and precise control of how the light matrix reacts. – input from pre-recorded video-clips (puredata and vvvv): a pre-recorded video clip is mapped to the resolution of the light matrix. Parameters such as playback speed, play forward or backward, pause, contrast, time and master intensity allow a smooth and precise control of how the light matrix reacts. – input from touchscreen window (vvvv): generation of up to 10 sphere objects when touching the window. x/y coordinates of each sphere define which zone of the light matrix is triggered, size affects the range of the part of the light matrix affected, several parameters such as scaleX and scaleY, blur, invert, master intensity and time, allow for a smooth and precise control of how the light matrix reacts. – video mixer with different inputs (1 or more touch windows, on or more video players / vvvv). Combination and mix of the above mentioned tools. 1. Software programming – for its ability to bring unpredictability, event –based thinking and a systems approach to lighting. I have opted for (the good old) stand-alone DMX light controller, the Lanbox, that comes packaged with the LC-edit lighting software. What the Lanbox makes suitable for my purpose, is the possibility for MIDI, serial, and analogue input – opening the possibility to trigger light through computer programming, algorithms and generative processes. For that I used the open source programs: processing, arduino and pure data. I owe Bruno Pocheron to have introduced me to his way of thinking about light and using the Lanbox. I participated in gangplank workshops, a fluid gathering of artists, technicians and theoreticians working in the field of performance arts, initiated by Bruno, where we experimented with software links. 2. Sensor Input – for its capacity to sense the environment and to allow a more equal influence of performative and environmental activities within a performative setting. Sensors generate data, obviously, but how to make to make sense of those data, how to filter and map them? Photo-voltaic cell and arduino. These deliver continuous reading of voltage and indicates intensity of light. Simple, passive, environmental senor. I am very interested using light sensors in lighting-systems, which might sound contradictory. But what happens when light reacts on light, or triggers other lighting events? When feedback loops are created and the environment itself gains the capacity to constantly change itself. Fore example in the project (un)focused, I used a light sensor in this capacity: When the performers concentrate, their brain state (measured by an EEG brain sensor) dynamically reduces the laser-light circles to a single point at the center of the room hitting the light sensor. 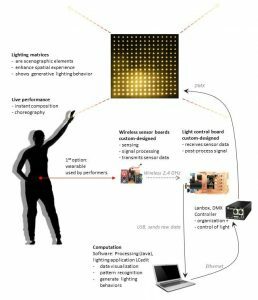 This sensor then triggers an entire matrix of blinding theater lights, enlarging the audience space. Developed by myself, Serge Offermans, Roos van Berkel. Custom-made. A sensing platform with with two movement sensors measuring acceleration (x,y,z) and rotation (x,y,z). Communicates wirelessly with the light control board. The sensors allows to map movement (of bodies, or objects) to light.